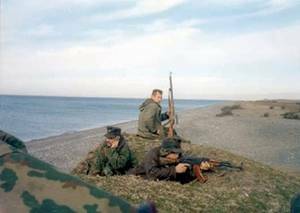 In early spring of 1993, in the midst of Russo-Georgian war for Abkhazia, a Ukrainian volunteer battalion “Argo” arrived to Sukhumi in order to help the Georgians to protect their territorial integrity and crush Russian-sponsored Apsuan extreme nationalists. Ukrainian volunteers under the command of Valeri Bobrowicz demonstrated discipline, devotion and high combat skills. Their battalion played an important role in the battle of Shroma, a strategically important village north of Sukhumi, the capital of Abkhazia (Georgia’s westernmost province at the Black Sea coast). 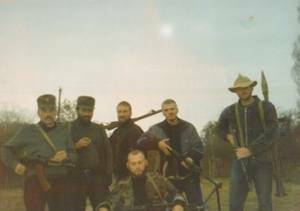 Seven Ukrainians died and some twenty were wounded while trying to protect Georgia in 1993. Several Ukrainians were decorated with the Georgian military order of Vakhtang Gorgasali, seven of them posthumously. 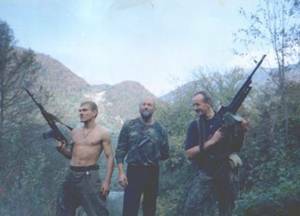 The fighters of “Argo” came on their own will nad never received any financial remuneration from either Georgian or any other government and thus cannot be considered mercenaries as Russian media often tend to label them. Click here to listen to the battle song of “Argo” fighters.